Abstract: The thick ascending limb (TAL) of Henle’s loop is a crucial segment for many tasks of the nephron. Indeed, the TAL is not only a mainstay for reabsorption of sodium (Na+), potassium (K+), and divalent cations such as calcium (Ca2+) and magnesium (Mg2+) from the luminal fluid, but also has an important role in urine concentration, overall acid–base homeostasis, and ammonia cycle. 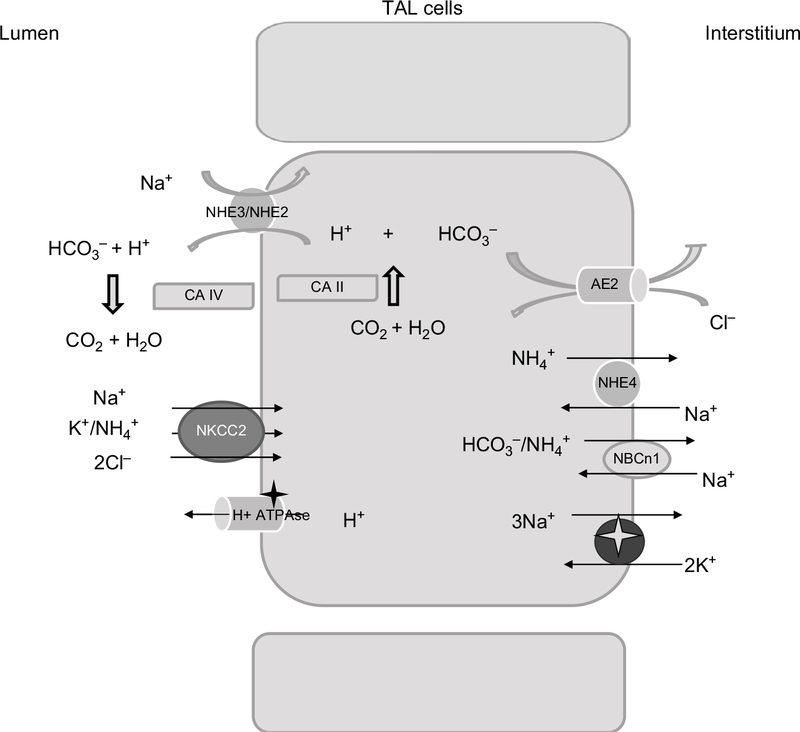 Transcellular Na+ transport along the TAL is a prerequisite for Na+, K+, Ca2+, Mg2+ homeostasis, and water reabsorption, the latter through its contribution in the generation of the cortico-medullar osmotic gradient. The role of this nephron site in acid–base balance, via bicarbonate reabsorption and acid secretion, is sometimes misunderstood by clinicians. This review describes in detail these functions, reporting in addition to the well-known molecular mechanisms, some novel findings from the current literature; moreover, the pathophysiology and the clinical relevance of primary or acquired conditions caused by TAL dysfunction are discussed. Knowing the physiology of the TAL is fundamental for clinicians, for a better understanding and management of rare and common conditions, such as tubulopathies, hypertension, and loop diuretics abuse. Additional Na+ reabsorption is driven by the generated electrical field through the paracellular way; moreover, other cations (Ca2+ and Mg2+) are reabsorbed by this route. Figure 1 Schematic representation of TAL cells, illustrating the major transcellular proteins involved in salt reabsorption. Abbreviations: TAL, thick ascending limb of the loop of Henle; ROMK, renal outer medulla K+ channels; CaSR, calcium sensing receptor; NCX, Na+/Ca2+ exchanger; PMCA, plasma membrane Ca2+ ATPase; NKCC2, Na-K-2Cl cotransporter. Abbreviations: UAKD, uromodulin-associated kidney disease; TAL, thick ascending limb of the loop of Henle; ROMK, renal outer medulla K+ channels; CaSR, calcium sensing receptor; NKCC2, Na-K-2Cl cotransporter; BS, Bartter syndrome. Figure 2 Mechanism of urine concentration. Note: Contribution of Na+, urea, and NH4+/NH3 in the generation of the interstitial medullar hyperosmolality. Abbreviations: PT, proximal tubule; DT, distal tubule; UTA2, urea transporter; NKCC2, Na-K-2Cl cotransporter; TAL, thick ascending limb of the loop of Henle; CCD, cortical collecting duct; OMCD, outer medullar collecting duct; IMCD, inner medulla collecting duct. The role of PT in bicarbonate reabsorption is well established.37–39 However, other downstream segments contribute to bicarbonate reabsorption. The loop of Henle reabsorbs a significant fraction (nearly 15%) of the filtered bicarbonate.40 In vivo studies have demonstrated that the descending limb of Henle’s loop has low bicarbonate permeability in rats. In contrast, the final segment of the PT (S3 portion) has been shown to be able to reabsorb bicarbonate. Under physiologic conditions, its contribution in bicarbonate reabsorption is modest, as it is actively reabsorbed along the early PT segments and its luminal concentration is low. Figure 3 Relevant proteins involved in acid–base homeostasis in the TAL. Abbreviations: NHE2/NHE3, isoforms 2 and 3 of the Na+, H+ exchangers; CA IV, isoform IV of carbonic anhydrase; CA II, isoform II of carbonic anhydrase; NKCC2, Na-K-2Cl cotransporter; AE2, Cl-HCO3– antiporter; TAL, thick ascending limb of the loop of Henle. Besides NHE3, additional molecules contribute to bicarbonate reabsorption in the TAL. Functional studies have suggested the presence of an active H+-ATPase, and immunohistochemical analysis has reported the presence of proton ATPase along the TAL.48 Its role in bicarbonate reabsorption is not considered as consistent as a Na+/H+ exchanger under physiological conditions. Inherited and acquired conditions leading to an imbalance in salt reabsorption along the TAL have a significant impact on human pathophysiology. Several water and electrolytes disturbances are attributed to TAL dysfunction. TAL hypofunction is responsible for water and electrolytes wasting, while increased salt absorption is considered a contributing factor in the pathogenesis of hypertension. Recently, cases of some male infants showing features of transient antenatal BS, associated with mutations in the MAGE-D2 gene, have been reported.71 The gene product is expressed in the DT and in the TAL in both adult and fetal human kidney. Immunostaining studies revealed reduced NKCC2 and Na+-Cl− cotransporter (NCC) apical abundance in one of these patients, with increased NKCC2 cytoplasmic retention. In vitro, MAGE-D2 promotes trafficking to the apical membrane of both NCC and NKCC2. The TAL has a central role in water and electrolyte homeostasis and acid–base balance, and its dysfunction has a crucial role in human pathophysiology. Increased awareness and understanding of its specific functions will enable physicians to better manage acquired and inherited conditions caused by TAL-defective salt absorption, and to reduce the incidence and the complications of potentially life-threatening conditions. Mount DB. Thick ascending limb of the loop of Henle.Clin J Am Soc Nephrol. 2014;9(11):1974–1986. Sands JM, Layton HE. The physiology of urinary concentration: an update.Semin Nephrol. 2009;29(3):178–195. Greger R. Ion transport mechanisms in thick ascending limb of Henle’s loop of mammalian nephron.Physiol Rev. 1985;65(3):760–795. Dantzler WH, Pannabecker TL, Layton AT, Layton HE. Urine concentrating mechanism in the inner medulla of the mammalian kidney: role of three-dimensional architecture.Acta Physiol (Oxf). 2011;202(3):361–378. Imai M, Tsuruoka S, Yoshitomi K, Junichi T, Suzuki M, Muto S. Morphological and functional heterogeneity of the thick ascending limb of Henle’s loop.Clin Exp Nephrol. 1999;3(1):9–17. Tsuruoka S, Koseki C, Muto S, Tabei K, Imai M. Axial heterogeneity of potassium transport across hamster thick ascending limb of Henle’s loop.Am J Physiol. 1994;267(1 Pt 2):F121–F129. Nielsen S, Maunsbach AB, Ecelbarger CA, Knepper MA. Ultrastructural localization of Na-K-2Cl cotransporter in thick ascending limb and macula densa of rat kidney.Am J Physiol. 1998;275(6 Pt 2):F885–F893. Mutig K. Trafficking and regulation of the NKCC2 cotransporter in the thick ascending limb.Curr Opin Nephrol Hypertens. 2017;26(5:392–397. Markadieu N, Delpire E. Physiology and pathophysiology of SLC12A1/2 transporters.Pflugers Arch. 2014;466(1):91–105. Ares GR, Caceres PS, Ortiz PA. Molecular regulation of NKCC2 in the thick ascending limb.Am J Physiol Renal Physiol. 2011;301(6:F1143–F1159. Hennings JC, Andrini O, Picard N, et al. The ClC-K2 chloride channel is critical for salt handling in the distal nephron.J Am Soc Nephrol. 2017;28(1):209–217. Stölting G, Fischer M, Fahlke C. CLC channel function and dysfunction in health and disease.Front Physiol. 2014;5:378. Trepiccione F, Zacchia M, Capasso G. Physiopathology of potassium deficiency. In: Alpern RJ, Caplan M, Moe OW, editors.Seldin and Giebisch’s The Kidney, Physiology and Pathophysiology. 5th ed. San Diego: Elsevier; 2013: 1713–1738. Zacchia M, Abategiovanni ML, Stratigis S, Capasso G. Potassium: from physiology to clinical implications.Kidney Dis (Basel). 2016;2(2):72–79. Loupy A, Ramakrishnan SK, Wootla B, et al. PTH-independent regulation of blood calcium concentration by the calcium-sensing receptor.J Clin Invest. 2012;122(9):3355–3367. Wang W, Lu M, Balazy M, Hebert SC. Phospholipase A2 is involved in mediating the effect of extracellular Ca2+ on apical K+ channels in rat TAL.Am J Physiol. 1997;273(3 Pt 2):F421–F429. Gong Y, Renigunta V, Himmerkus N, et al. Claudin-14 regulates renal Ca++ transport in response to CaSR signalling via a novel microRNA pathway.EMBO J. 2012;31(8):1999–2012. Riccardi D, Valenti G. Localization and function of the renal calcium-sensing receptor.Nat Rev Nephrol. 2016;12(7):414–425. Kiuchi-Saishin Y, Gotoh S, Furuse M, Takasuga A, Tano Y, Tsukita S. Differential expression patterns of claudins, tight junction membrane proteins, in mouse nephron segments. J Am Soc Nephrol. 2002;13(4):875–886. Gong Y, Hou J. Claudins in barrier and transport function-the kidney.Pflugers Arch. 2017;469(1):105–113. 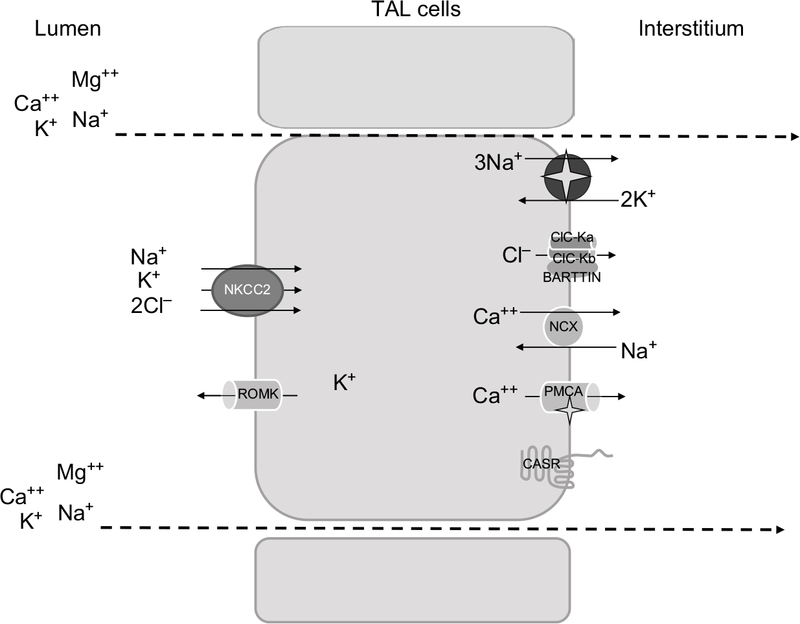 Blaine J, Chonchol M, Levi M. Renal control of calcium, phosphate, and magnesium homeostasis. Clin J Am Soc Nephrol. 2015;10(7):1257–1272. Hoenderop JG, Hartog A, Stuiver M, Doucet A, Willems PH, Bindels RJ. Localization of the epithelial Ca2+ channel in rabbit kidney and intestine. J Am Soc Nephrol. 2000;11(7):1171–1178. Ellison DH. Divalent cation transport by the distal nephron: insights from Bartter’s and Gitelman’s syndromes.Am J Physiol Renal Physiol. 2000;279(4):F616–F625. Godron A, Harambat J, Boccio V, et al. Familial hypomagnesemia with hypercalciuria and nephrocalcinosis: phenotype–genotype correlation and outcome in 32 patients with CLDN16 or CLDN19 mutations. Clin J Am Soc Nephrol. 2012;7(5):801–809. Watanabe S, Fukumoto S, Chang H, et al. Association between activating mutations of calcium-sensing receptor and Bartter’s syndrome. Lancet. 2002;360(9334):692–694. Carmosino M, Procino G, Svelto M. Na+-K+-2Cl- cotransporter type 2 trafficking and activity: the role of interacting proteins. Biol Cell. 2012;104(4):201–212. Trudu M, Janas S, Lanzani C, et al. Common noncoding UMOD gene variants induce salt-sensitive hypertension and kidney damage by increasing uromodulin expression. Nat Med. 2013;19(12):1655–1660. Ferdaus MZ, Barber KW, López-Cayuqueo KI, et al. SPAK and OSR1 play essential roles in potassium homeostasis through actions on the distal convoluted tubule. J Physiol. 2016;594(17):4945–4966. Kim WY, Lee HW, Han KH, et al. Descending thin limb of the intermediate loop expresses both aquaporin 1 and urea transporter A2 in the mouse kidney.Histochem Cell Biol. 2016;146(1):1–12. Yang B, Bankir L. Urea and urine concentrating ability: new insights from studies in mice. Am J Physiol Renal Physiol. 2005;288(5):F881–F896. Zacchia M, Di Iorio V, Trepiccione F, Caterino M, Capasso G. The kidney in Bardet–Biedl syndrome: possible pathogenesis of urine concentrating defect.Kidney Dis (Basel). 2017;3(2):57–65. Zona E, Zacchia M, Di Iorio V, Capolongo G, Rinaldi L, Capasso G. Il coinvolgimento renale nella sindrome di Bardet-Biedl [Patho-physiology of renal dysfunction in Bardet–Biedl syndrome].G Ital Nefrol. 2017;34(5):62–72. Italian. Fenton RA, Knepper MA. Urea and renal function in the 21st century: insights from knockout mice.J Am Soc Nephrol. 2007;18(3):679–688. Zimmerhackl BL, Robertson CR, Jamison RL. The medullary microcirculation.Kidney Int. 1987;31(2):641–647. Fenton RA. Urea transporters and renal function: lessons from knockout mice.Curr Opin Nephrol Hypertens. 2008;17(5):513–518. Zacchia M, Capasso G. Dehydration: a new modulator of klotho expression.Am J Physiol Renal Physiol. 2011;301(4):F743–F744. Ambühl PM, Amemiya M, Danczkay M, et al. Chronic metabolic acidosis increases NHE3 protein abundance in rat kidney.Am J Physiol. 1996;271(4 Pt 2):F917–F925. Preisig PA. The acid-activated signaling pathway: starting with Pyk2 and ending with increased NHE3 activity.Kidney Int. 2007;72(11:1324–1329. Liu L, Zacchia M, Tian X, et al. Acid regulation of NaDC-1 requires a functional endothelin B receptor.Kidney Int. 2010;78(9):895–904. Capasso G, Unwin R, Giebisch G. Role of the loop of Henle in urinary acidification.Kidney Int Suppl. 1991;33:S33–S35. Capasso G, Unwin R, Agulian S, Giebisch G. Bicarbonate transport along the loop of Henle. I. Microperfusion studies of load and inhibitor sensitivity. J Clin Invest. 1991;88(2):430–437. Good DW, Watts BA 3rd. Functional roles of apical membrane Na+/H+ exchange in rat medullary thick ascending limb.Am J Physiol. 1996;270(4 Pt 2):F691–F699. Paillard M. H+ and HCO3− transporters in the medullary thick ascending limb of the kidney: molecular mechanisms, function and regulation.Kidney Int Suppl. 1998;65:S36–S41. Ledoussal C, Lorenz JN, Nieman ML, Soleimani M, Schultheis PJ, Shull GE. Renal salt wasting in mice lacking NHE3 Na+/H+ exchanger but not in mice lacking NHE2. Am J Physiol Renal Physiol. 2001;281(4):F718–F727. de Bruijn PI, Larsen CK, Frische S, et al. Furosemide-induced urinary acidification is caused by pronounced H+ secretion in the thick ascending limb. Am J Physiol Renal Physiol. 2015;309(2):F146–F153. Houillier P, Bourgeois S. More actors in ammonia absorption by the thick ascending limb. Am J Physiol Renal Physiol. 2012;302(3:F293–F297. Eladari D, Blanchard A, Leviel F, et al. Functional and molecular characterization of luminal and basolateral Cl-/HCO-3 exchangers of rat thick limbs.Am J Physiol. 1998;275(3 Pt 2):F334–F342. Capasso G, Unwin R, Rizzo M, Pica A, Giebisch G. Bicarbonate transport along the loop of Henle: molecular mechanisms and regulation.J Nephrol. 2002;15 (Suppl 5):S88–S96. Capasso G, Unwin R, Ciani F, et al. Bicarbonate transport along the loop of Henle. II. Effects of acid-base, dietary, and neurohumoral determinants.J Clin Invest. 1994;94(2):830–838. Weiner ID, Verlander JW. Renal ammonia metabolism and transport.Compr Physiol. 2013;3(1):201–220. Amlal H, Paillard M, Bichara M. NH4+ transport pathways in cells of medullary thick ascending limb of rat kidney. NH4+ conductance and K+/NH4+(H+) antiport.J Biol Chem. 1994;269(35:21962–21971. Blanchard A, Eladari D, Leviel F, Tsimaratos M, Paillard M, Podevin RA. NH4+ as a substrate for apical and basolateral Na+-H+ exchangers of thick ascending limbs of rat kidney: evidence from isolated membranes.J Physiol. 1998;506(Pt 3):689–698. Lee S, Lee HJ, Yang HS, Thornell IM, Bevensee MO, Choi I. Sodium-bicarbonate cotransporter NBCn1 in the kidney medullary thick ascending limb cell line is upregulated under acidic conditions and enhances ammonium transport.Exp Physiol. 2010;95(9):926–937. Weiner ID, Mitch WE, Sands JM. Urea and ammonia metabolism and the control of renal nitrogen excretion.Clin J Am Soc Nephrol. 2015;10(8:1444–1458. Biver S, Belge H, Bourgeois, et al. A role for Rhesus factor Rhcg in renal ammonium excretion and male fertility.Nature. 2008;456(7220:339–343. Jain G, Ong S, Warnock DG. Genetic disorders of potassium homeostasis.Semin Nephrol. 2013;33(3):300–309. Takahashi N, Chernavvsky DR, Gomez RA, Igarashi P, Gitelman HJ, Smithies O. Uncompensated polyuria in a mouse model of Bartter’s syndrome.Proc Natl Acad Sci U S A. 2000;97(10):5434–5439. Lorenz JN, Baird NR, Judd LM, et al. Impaired renal NaCl absorption in mice lacking the ROMK potassium channel, a model for type II Bartter’s syndrome. J Biol Chem. 2002;277(40):37871–37880. Kemter E, Rathkolb B, Bankir L. Mutation of the Na(+)-K(+)-2Cl(−) cotransporter NKCC2 in mice is associated with severe polyuria and a urea-selective concentrating defect without hyperreninemia. Am J Physiol Renal Physiol. 2010;298(6):F1405–F1415. Bailey MA, Cantone A, Yan Q, et al. Maxi-K channels contribute to urinary potassium excretion in the ROMK-deficient mouse model of type II Bartter’s syndrome and in adaptation to a high-K diet. Kidney Int. 2006;70(1):51–59. McCormick JA, Ellison DH. Distal convoluted tubule.Compr Physiol. 2015;5(1):45–98. Zacchia M, Capasso G. Parvalbumin: a key protein in early distal tubule NaCl reabsorption.Nephrol Dial Transplant. 2008;23(4:1109–1111. Koulouridis E, Koulouridis I. Molecular pathophysiology of Bartter’s and Gitelman’s syndromes.World J Pediatr. 2015;11(2):113–125. Pressler CA, Heinzinger J, Jeck N, et al. Late-onset manifestation of antenatal Bartter syndrome as a result of residual function of the mutated renal Na+-K+-2Cl− co-transporter. J Am Soc Nephrol. 2006;17(8):2136–2142. Zacchia M, Capolongo G, Rinaldi L, Capasso G. Fisiopatologia dell’handling renale dell’acido urico [Renal handling of uric acid].G Ital Nefrol. 2015;32 (Suppl 62). Italian. Seys E, Andrini O, Keck M, et al. Clinical and genetic spectrum of Bartter syndrome type 3. J Am Soc Nephrol. 2017;28(8):2540–2552. Grill A, Schießl IM, Gess B, Fremter K, Hammer A, Castrop H. Salt-losing nephropathy in mice with a null mutation of the Clcnk2 gene. Acta Physiol (Oxf). 2016;218(3):198–211. Hannan FM, Thakker RV. Calcium-sensing receptor (CaSR) mutations and disorders of calcium, electrolyte and water metabolism.Best Pract Res Clin Endocrinol Metab. 2013;27(3):359–371. Riccardi D, Brown EM. 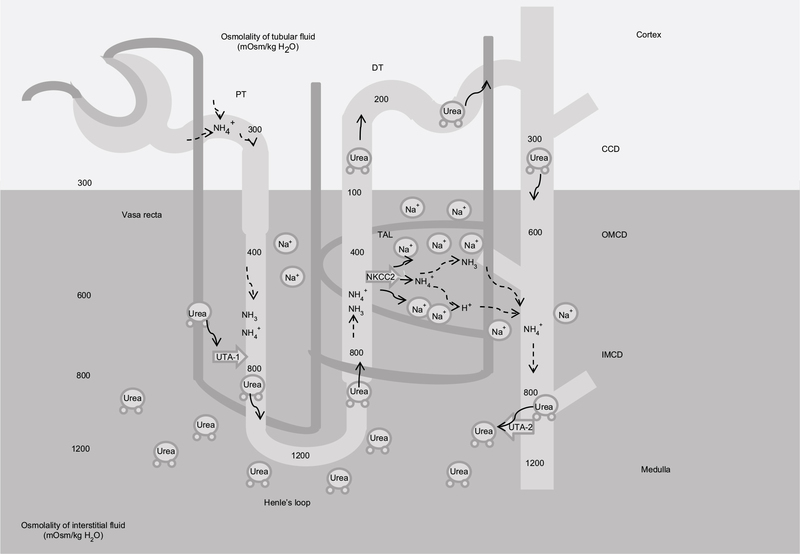 Physiology and pathophysiology of the calcium sensing receptor in the kidney.Am J Physiol. 2010;298(3):F485–F499. Vargas-Poussou R, Huang C, Hulin P, et al. Functional characterization of a calcium-sensing receptor mutation in severe autosomal dominant hypocalcemia with a Bartter-like syndrome.J Am Soc Nephrol. 2002;13(9):2259–2266. Laghmani K, Beck BB, Yang SS, et al. Polyhydramnios, transient antenatal Bartter’s syndrome, and MAGED2 mutations.N Engl J Med. 2016;374(19):1853–1863. Hou J, Rajagopa M, Yu AS. Claudins and the kidney.Annu Rev Physiol. 2013;75:479–501. Simon DB, Lu Y, Choate KA, et al. Paracellin-1, a renal tight junction protein required for paracellular Mg2+ resorption.Science. 1999;285(5424):103–106. Sikora P, Zaniew M, Haisch L, et al. Retrospective cohort study of familial hypomagnesaemia with hypercalciuria and nephrocalcinosis due to CLDN16 mutations.Nephrol Dial Transplant. 2015;30(4):636–644. Konrad M, Schaller A, Seelow D, et al. Mutations in the tight-junction gene claudin 19 (CLDN19) are associated with renal magnesium wasting, renal failure, and severe ocular involvement.Am J Hum Genet. 2006;79(5):949–957. Breiderhoff T, Himmerkus N, Stuiver M, et al. Deletion of claudin-10 (Cldn10) in the thick ascending limb impairs paracellular sodium permeability and leads to hypermagnesemia and nephrocalcinosis. Proc Natl Acad Sci U S A. 2012;109(35):14241–14246. Bongers EMHF, Shelton LM, Milatz S, et al. A novel hypokalemic-alkalotic salt-losing tubulopathy in patients with CLDN10 mutations. J Am Soc Nephrol. 2017;28(10):3118–3128. Hadj-Rabia S, Brideau G, Al-Sarraj Y, et al. Multiplex epithelium dysfunction due to CLDN10 mutation: the HELIX syndrome. Genet Med. Epub 2017 Aug 3. Thorleifsson G, Holm H, Edvardsson V, et al. Sequence variants in the CLDN14 gene associate with kidney stones and bone mineral density.Nat Genet. 2009;41(8):926–930. Corre T, Olinger E, Harris SE, et al. Common variants in CLDN14 are associated with differential excretion of magnesium over calcium in urine. Pflugers Arch. 2017;469(1):91–103. Stuiver M, Lainez S, Will C, et al. CNNM2, encoding a basolateral protein required for renal Mg2+ handling, is mutated in dominant hypomagnesemia.Am J Hum Genet. 2011;88(3):333–343. Funato Y, Yamazaki D, Miki H. Renal function of cyclin M2 Mg2+ transporter maintains blood pressure.J Hypertens. 2017;35(3):585–592. Meyer TE, Verwoert GC, Hwang SJ, et al. Genome-wide association studies of serum magnesium, potassium, and sodium concentrations identify six loci influencing serum magnesium levels. PLoS Genet. 2010;6(8):e1001045. Abdelhadi O, Iancu D, Stanescu H, Kleta R, Bockenhauer D. EAST syndrome: clinical, pathophysiological, and genetic aspects of mutations in KCNJ10.Rare Dis. 2016;4(1):e1195043. Reichold M, Zdebik AA, Lieberer E, et al. CNJ10 gene mutations causing EAST syndrome (epilepsy, ataxia, sensorineural deafness, and tubulopathy) disrupt channel function.Proc Natl Acad Sci U S A. 2010;107(32):14490–14495. Fan L, Wang X, Zhang D, et al. Vasopressin-induced stimulation of the Na(+)-activated K(+) channels is responsible for maintaining the basolateral K(+) conductance of the thick ascending limb (TAL) in EAST/SeSAME syndrome. Biochim Biophys Acta. 2015;1852(11):2554–2562. Suomalainen A, Battersby BJ. Mitochondrial diseases: the contribution of organelle stress responses to pathology.Nat Rev Mol Cell Biol. Epub 2017 Aug 9. Emma F, Salviati L. Mitochondrial cytopathies and the kidney.Nephrol Ther. 2017;13 (Suppl 1):S23–S28. Emma F, Montini G, Parikh SM, Salviati L. Mitochondrial dysfunction in inherited renal disease and acute kidney injury.Nat Rev Nephrol. 2016;12(5):267–280. Trepiccione F, Zacchia M, Capasso G. The role of the kidney in salt-sensitive hypertension.Clin Exp Nephrol. 2012;16(1):68–72. Frame AA, Wainford RD. Renal sodium handling and sodium sensitivity.Kidney Res Clin Pract. 2017;36(2):117–131. Petrazzuolo O, Trepiccione F, Zacchia M, Capasso G. Hypertension and renal calcium transport.J Nephrol. 2010;23(Suppl 16):S112–S117. Warnock DG. Genetic forms of human hypertension.Curr Opin Nephrol Hypertens. 2001;10(4):493–499. Graham LA, Dominiczak AF, Ferreri NR. Role of renal transporters and novel regulatory interactions in the TAL that control blood pressure.Physiol Genomics. 2017;49(5):261–276. Capasso G, Rizzo M, Garavaglia M. Upregulation of apical sodium-chloride cotransporter and basolateral chloride channels is responsible for the maintenance of salt-sensitive hypertension.Am J Physiol Renal Physiol. 2008;295(2):F556–F567. Kirchner KA. Increased loop chloride uptake precedes hypertension in Dahl salt-sensitive rats.Am J Physiol. 1992;262(2 Pt 2):R263–R268. Aviv A, Hollenberg NK, Weder A. Urinary potassium excretion and sodium sensitivity in blacks.Hypertension. 2004;43(4):707–713. Luft FC, Grim CE, Fineberg N, Weinberger MC. Effects of volume expansion and contraction in normotensive whites, blacks, and subjects of different ages.Circulation. 1979;59(4):643–650. Monette MY, Rinehart J, Lifton RP, Forbush B. Rare mutations in the human Na-K-Cl cotransporter (NKCC2) associated with lower blood pressure exhibit impaired processing and transport function.Am J Physiol Renal Physiol. 2011;300(4):F840–F847. Zacchia M, Capasso G. The importance of uromodulin as regulator of salt reabsorption along the thick ascending limb.Nephrol Dial Transplant. 2015;30(2):158–160. Zacchia M, Zacchia E, Zona E, et al. Renal phenotype in Bardet–Biedl syndrome: a combined defect of urinary concentration and dilution is associated with defective urinary AQP2 and UMOD excretion.Am J Physiol Renal Physiol. 2016;311(4):F686–F694. Graham LA, Padmanabhan S, Fraser NJ, et al. Validation of uromodulin as a candidate gene for human essential hypertension.Hypertension. 2014;63(3):551–558. Blankenstein KI, Borschewski A, Labes R, et al. Calcineurin inhibitor cyclosporine A activates renal Na-K-Cl cotransporters via local and systemic mechanisms. Am J Physiol Renal Physiol. 2017;312(3):F489–F501. Esteva-Font C, Guillén-Gómez E, Diaz JM. Renal sodium transporters are increased in urinary exosomes of cyclosporine-treated kidney transplant patients.Am J Nephrol. 2014;39(6):528–535. Unwin R, Capasso G, Giebisch G. Potassium and sodium transport along the loop of Henle: effects of altered dietary potassium intake.Kidney Int. 1994;46(4):1092–1099. McKay AJ, Peterson LN. K infusion corrects thick ascending limb Cl reabsorption in K-depleted rats by an aldosterone-independent mechanism.Am J Physiol. 1993;264(5 Pt 2):F792–F799. Gutsche HU, Peterson LN, Levine DZ. In vivo evidence of impaired solute transport by the thick ascending limb in potassium-depleted rats. J Clin Invest. 1984;73(4):908–916. Yang SS, Lo YF, Wu CC, et al. SPAK-knockout mice manifest Gitelman syndrome and impaired vasoconstriction. J Am Soc Nephrol. 2010;21(11):1868–1877. Lin SH, Yu IS, Jiang ST, et al. Impaired phosphorylation of Na+-K+-2Cl− cotransporter by oxidative stress-responsive kinase-1 deficiency manifests hypotension and Bartter-like syndrome. Proc Natl Acad Sci U S A. 2011;108(42):17538–17543. Chang CT, Hung CC, Tian YC, Yang CW, Wu MS. Ciclosporin reduces paracellin-1 expression and magnesium transport in thick ascending limb cells.Nephrol Dial Transplant. 2007;22(4):1033–1040. Hoorn EJ, Ellison DH. Diuretic resistance.Am J Kidney Dis. 2017;69(1:136–142. Bartoli E, Rossi L, Sola D, Castello L, Sainaghi PP, Smirne C. Use, misuse and abuse of diuretics.Eur J Intern Med. 2017;39:9–17. Kokot F, Hyla-Klekot L. Drug-induced abnormalities of potassium metabolism.Pol Arch Med Wewn. 2008;118(7–8):431–434. Sica DA, Carter B, Cushman W, Hamm L. Thiazide and loop diuretics.J Clin Hypertens (Greenwich). 2011;13(9):639–644. Lapsia V, Kazory A. Loop diuretics for heart failure-associated hyponatremia.Am J Med. 2010;123(8):e5–e6. Halbgewachs C, Domes T. Postobstructive diuresis: pay close attention to urinary retention.Can Fam Physician. 2015;61(2):137–142. McDougal WS, Wright FS. Defect in proximal and distal sodium transport in post-obstructive diuresis.Kidney Int. 1972;2(6):304–317. Yarger WE, Aynedjian HS, Bank N. A micropuncture study of postobstructive diuresis in the rat.J Clin Invest. 1972;51(3):625–637. Li C, Wang W, Kwon TH, Knepper MA, Nielsen S, Frøkiaer J. Altered expression of major renal Na transporters in rats with bilateral ureteral obstruction and release of obstruction.Am J Physiol Renal Physiol. 2003;285(5):F889–F901. Han SJ, Noh MR, Jung JM et al. Hydrogen sulfide-producing cystathionine γ-lyase is critical in the progression of kidney fibrosis.Free Radic Biol Med. 2017;112:423–432. Perna AF, Di Nunzio A, Amoresano A et al. Divergent behavior of hydrogen sulfide pools and of the sulfur metabolite lanthionine, a novel uremic toxin, in dialysis patients.Biochimie. 2016;126:97–107. Xia M, Chen L, Muh RW, Li PL, Li N. Production and actions of hydrogen sulfide, a novel gaseous bioactive substance, in the kidneys.J Pharmacol Exp Ther. 2009;329(3):1056–1062.